Wahoo!! 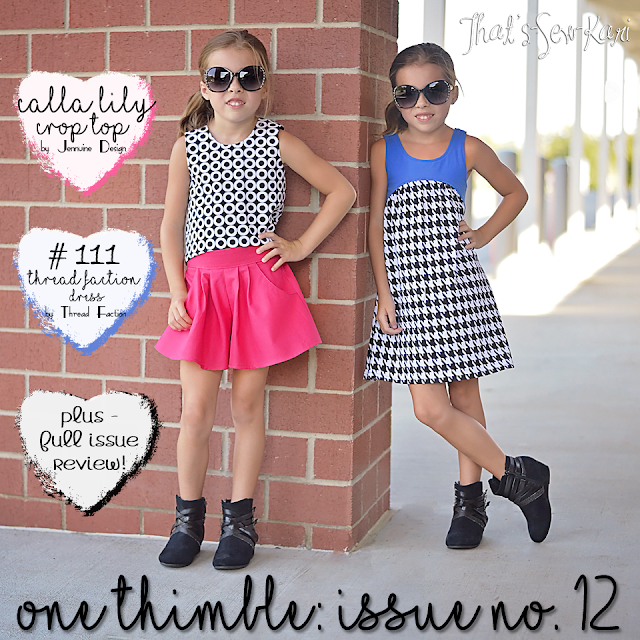 It's time for another issue of One Thimble -- the most creative and inspiring sewing e-zine. Issue 12 is now upon us and I cannot wait to share what's inside. Let's have a look at the cover! Isn't it gorgeous?! 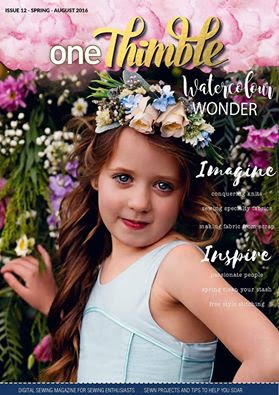 This issue's theme is watercolour and the pictures are amazing and so inspiring. Inside, you will find 10 PDF sewing patterns ($103 AUD value), and 25 tutorials/interviews/articles! WOW! At just $25 AUD ($19.12 USD), this is a steal. The great thing about One Thimble is you get an entire magazine at your fingertips for a variety of tips, tutorial and inspiration for growing in your craft. I always brew a fresh cup of coffee and sit down with my tablet to read through it. Reading all the pattern instructions helps me figure out which patterns are at the top of my sew-list. It definitely gets my creative juices flowing! Plus, I always learn something new! How to make fabric from scraps -- this blew my mind! Make a hair accessory holder --my girls need these for their rooms! Sewing tips for specialty fabrics such as knit, leathers, etc. The sewing patterns I cannot wait to sew next are the Flutterby Kite for my girls' rooms, Azure Party Dresses for Daddy/Daughter dances this year and the Brook Blossom Skirt for ME in my IKEA funky fabric find! I chose a striking black/white geometric print fabric for the main (Hancock's liquidation find) and a solid black for the reverse. The Moku Shorts (One Thimble, Issue 5) were sewn in a hot pink Kona cotton and modified to have pockets. The back features two placket styles -- hidden or visible. I chose to make my placket visible on the main side, but it's hidden when my daughter wears the reverse side! Because I used Kam snaps, it makes it even easier to wear on the reverse side. P.S. The way the placket is sewn is genius -- don't doubt the instructions! It really does work out! This simple sew makes a big statement! Plus, making it reversible doubles your daughter's wardrobe possibilities at half the time. 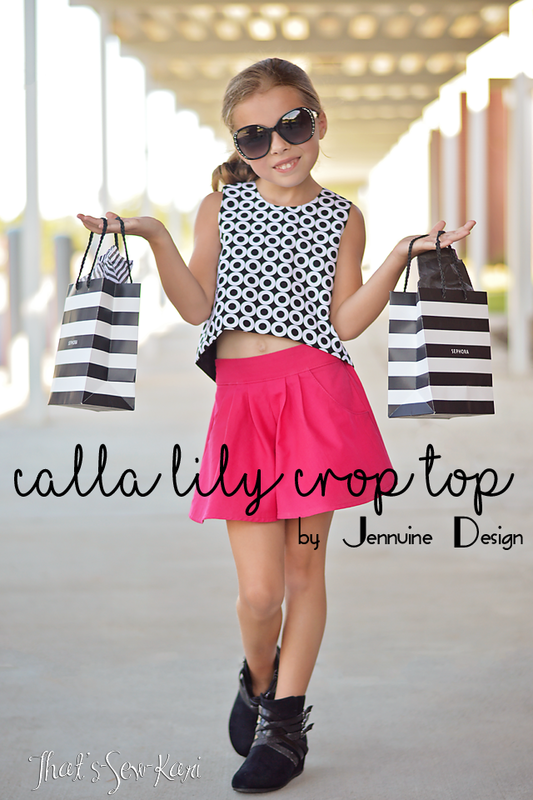 It would be perfect for any capsule wardrobe planners. Add a simple tank top and it's school appropriate! Next, I sewed the #111 Thread Faction Dress by Thread Faction. This is an all knit dress with a curved bodice and a-line skirt. The bodice is lined, eliminating the need for any neck/arm bands. The dress comes together super easily and in a way you'd never expect! 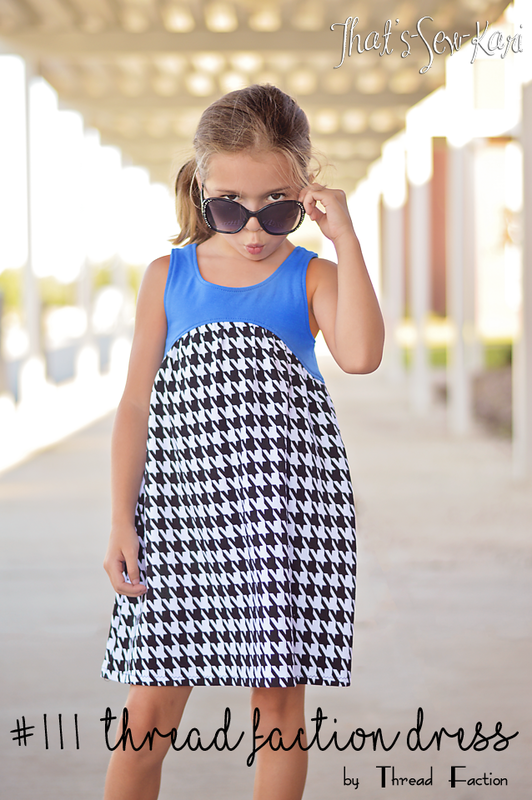 I chose a solid blue cotton lycra blend (from Walmart) and paired it with a houndstooth jersey cotton I spied on Amazon earlier this year! I am all about style on a budget! The back features a slight racerback. The instructions are well written, with easy to follow size blending information. I was lucky enough that my daughter's measurements were the exact sizes she blended in the tutorial! So what do you think?! 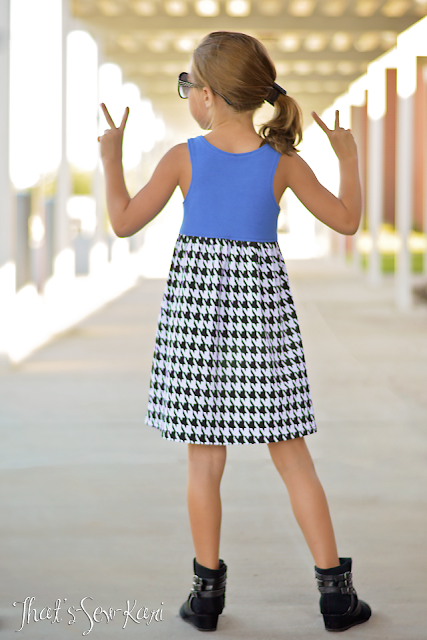 What patterns are you most excited about from Issue 12? Looking for more One Thimble Issue 12 inspiration? Be sure to visit the rest of the tour stops! *** This post contains affiliate links. By purchasing through my link, I receive a small compensation. This issue was sent to me complimentary in exchange for my review. All thoughts are mine -- no compensation given for this review.